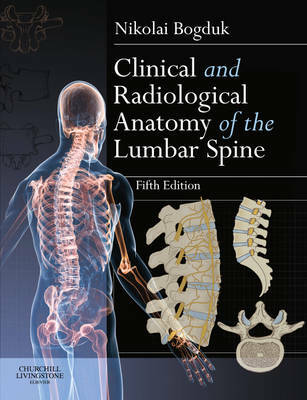 "Clinical and Radiological Anatomy of the Lumbar Spine, 5/e" continues to offer practical, comprehensive coverage of the subject area in a unique single volume which successfully bridges the gap between the basic science of the lumbar region and findings commonly seen in the clinic. Prepared by an author of international renown, "Clinical and Radiological Anatomy of the Lumbar Spine, 5/e" provides clear anatomical descriptions of the individual components of the lumbar region, as well as the intact spine, accompanied by a full colour artwork programme. Detailed anatomical descriptions are followed by an explanation of the basic principles of biomechanics and spinal movement together with a comprehensive overview of embryology and the influence of age-related change in the lumbar region. The problem of low back pain and instability are also fully explored while an expanded section on medical imaging completes the volume. "Clinical and Radiological Anatomy of the Lumbar Spine, 5/e" offers practical, validated and clinically relevant information to all practitioners and therapists working in the field of low back pain and will be ideal for students and practitioners of chiropractic, osteopathic medicine and osteopathy, physiotherapy, physical therapy, pain medicine and physiatry worldwide.